The intermediate-stage hearing scheduled for April 19 in the Molina Theissen case was suspended by the presiding judge. The criminal case is based on the illegal capture and torture suffered by Emma Molina Theissen between September 27 and October 5, 1981 and the disappearance of 14-year-old Marco Antonio Molina Theissen on October 6, 1981. The latter was an act of revenge committed by members of the Guatemalan military for his sister’s escape from the military zone in Quetzaltenango where she had been illegally detained. Those accused of committing these crimes, Edilberto Letona Linares, Francisco Luis Gordillo, Manuel Callejas y Callejas y Hugo Zaldaña Rojas, have been indicted and are in pre-trial detention. Yesterday as the trial was set to begin the judge informed the parties that she had processed an appeal filed by one of the accused, Letona Linares, challenging a prior ruling from March 1, 2016 denying the petition to apply the National Reconciliation Law (“amnesty law”). In sharing her decision, she said that despite the fact that the law required the hearing to move forward, she considered it necessary to suspend the opening of the hearing in order to avoid later rulings that could force the repetition of previous stages of the trial. The suspension of the hearing is detrimental to the Guatemalan justice system, it re-victimizes the family, above all Marco Antonio’s mother. Furthermore, it is contrary to the Inter-American Court of Human Rights (IACHR) ruling against the Guatemalan government in the supervisory hearing regarding compliance with Court sentences, on November 24, 2014. Compliance is obligatory due to the principal of Conventionality Control, given that Guatemala is party to the American Convention on Human Rights. In its resolution, regarding the obligation to investigate, prosecute and punish those implicated in the violation of the rights of Marco Antonio and the victims in eleven other cases sentenced by the Inter-American entity, the IACHR specifies that judges’ actions should not become delay tactics or impede the judicial process, and that the State should abstain from resorting to amnesty, applying statutes of limitations or establishing exemptions from responsibility. The judge’s decision today opens the door to more delay tactics and suggests an eventual push-back of the trial date, which violates the right to access to justice for the victims of serious human rights violations and the principal of speedy judicial remedy. The family will remain attentive to the impacts on the case and will continue to demand justice for Marco Antonio, as well as demanding the identification and return of his remains to provide a dignified burial. The family has strong convictions that only justice will make it possible to ensure that Guatemalan boys and girls NEVER AGAIN suffer torture and forced disappearance. La audiencia de fase intermedia programada para el 19 de abril en el caso Molina Theissen fue suspendida por la jueza contralora. El proceso penal es impulsado por la captura ilegal y torturas sufridas por Emma entre el 27 de septiembre y el 5 de octubre de 1981 y la desaparición del niño de 14 años Marco Antonio Molina el 6 de octubre de 1981, un acto de venganza cometido por elementos del ejército guatemalteco debido a la fuga de su hermana de la zona militar de Quezaltenango en donde estuvo ilegalmente retenida. Como sindicados por estos hechos se encuentran ligados a proceso penal y en prisión preventiva los señores Edilberto Letona Linares, Francisco Luis Gordillo, Manuel Callejas y Callejas y Hugo Zaldaña Rojas. Ayer, una vez instalado el tribunal y antes del inicio de la diligencia, la juzgadora informó de que había dado trámite a la apelación presentada por el sindicado Letona Linares contra la resolución previa de denegar la petición de aplicar la Ley de Reconciliación Nacional (“ley de amnistía”), del 1 de marzo de 2016. Al expresar su decisión dijo que, pese a considerar que la ley demandaba la realización de dicha audiencia, consideraba necesario suspender el acto procesal de apertura a juicio para evitar que resoluciones posteriores obligasen a “retrotraer” a etapas procesales ya concluidas. La familia Molina Theissen, en tanto querellante adhesiva en el proceso, expresó su desacuerdo con base en el artículo 408 del Código Procesal Penal (CPP) el cual precisa que todas las apelaciones se otorgarán sin que se deba suspender el procedimiento; asimismo, el artículo 291 indica que “si el tribunal rechaza la cuestión mandará seguir el procedimiento”. La suspensión de la audiencia es perjudicial para la justicia guatemalteca, revictimiza a la familia, sobre todo a la madre de Marco Antonio, y contraviene lo ordenado por la Corte Interamericana de Derechos Humanos (Corte IDH) al Estado de Guatemala en su resolución de supervisión de cumplimiento de sentencia del 24 de noviembre de 2014, obligatoria por el principio de control de convencionalidad dado que es parte de la Convención Americana sobre Derechos Humanos. En esta resolución, sobre la obligación de investigar, juzgar y castigar a los implicados en la violación a los derechos humanos de Marco Antonio y las víctimas de otros once casos juzgados por este órgano interamericano, la Corte IDH especifica que los jueces deben actuar de manera que los recursos judiciales no tengan efectos dilatorios y entorpecedores en el proceso, así como que el Estado se debe abstener de recurrir a la amnistía, la prescripción o el establecimiento de excluyentes de responsabilidad. La decisión de la juzgadora abre las puertas para más recursos dilatorios y plantea un eventual retardo de la apertura a juicio, lo cual significa la violación al derecho de acceso a la justicia de las víctimas de graves violaciones a los derechos humanos y al principio de justicia pronta y cumplida. La familia se mantendrá atenta a las incidencias del proceso y continuará demandando justicia para Marco Antonio, así como la ubicación y devolución de sus restos para sepultarlos dignamente con la convicción de que solamente la justicia hará posible que NUNCA MÁS los niños y niñas guatemaltecos sufran torturas y desaparición forzada. Sepur Zarco: The Case of sexual and domestic slavery against 15 Q’eqchi’ women at the Sepur Zarco military outpost goes to trial on Feb. 1, more than 30 years after the crimes were committed. GHRC’s recent post shares background and resources to stay up-to-date as the trial moves forward. CREOMPAZ: A recent article from NACLA looks at the recent arrests of 18 former military, most of whom were arrested for their connections with crimes committed at the CREOMPAZ base in Coban. 12 of accused had been students at the US School of the Americas. Another suspect, Congressman Edgar Justino Ovalle of the President’s FCN Nation political party, enjoys immunity from prosecution, a protection recently upheld by the Guatemala Supreme Court. After 30 years of impunity, the case of sexual and domestic slavery at the Sepur Zarco military outpost will finally be heard in a court of law on Monday, February 1. This is a landmark case — the first time a domestic court has heard a case on wartime sexual slavery. GHRC will be observing the trial and you can follow progress via our live tweets by following @GHRCUSA. There should be a link to a live stream available; see GHRC’s facebook and twitter for updates on Monday. 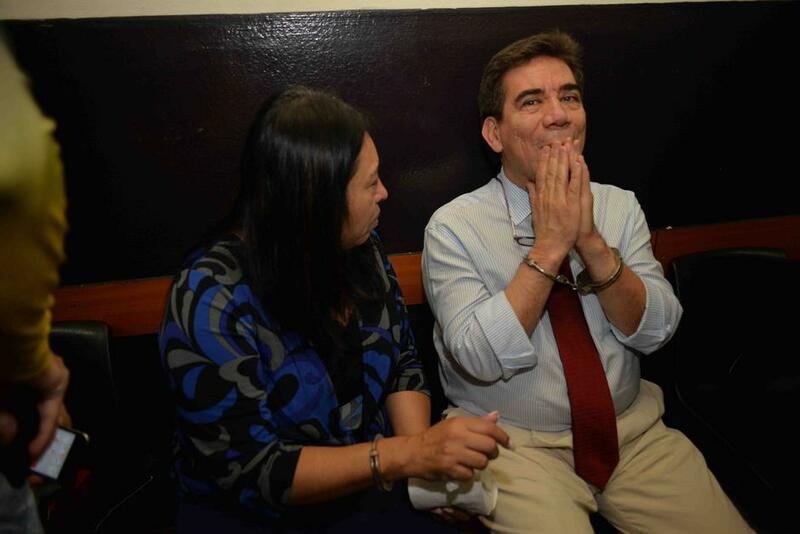 Captured lawyer Jose Arturo Morales. Photo: Insight Crime. After the investigation into a web of judicial corruption, nicknamed the “Law Firm of Impunity,” Guatemala’s failed judicial system may be headed for long-needed reforms. Revelations began in April 2015 when the UN-sponsored International Commission Against Impunity in Guatemala (CICIG) uncovered a massive tax fraud scheme involving numerous high-level government officials. Among those directly incriminated in the corruption ring, dubbed “La Linea,” were the head of Guatemala’s customs enforcement and tax agency and the private secretary of Vice President Roxana Baldetti, Juan Carlos Monzón, who led the operation. The scandal, one of the biggest in recent memory in Guatemala, barely had time to sink in, before a related scandal broke, prompted by judges who had suspiciously granted bail to the high level officials arrested. Corruption, it became clear, was being facilitated by those charged with upholding the law.